The POPse! final report has now been published. This publication brings together a sample of material produced throughout the week. It will be sent to policymakers, influencers, practitioners and contributors who can move those specific debates and areas of practice on. We think, and hope, that there is honesty, insight, and constructive new thinking in here. 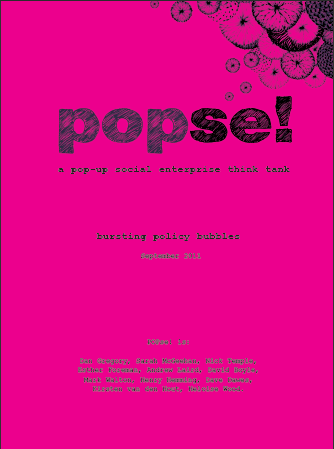 We believe POPse! taught us that the social enterprise world relishes a bit of humour (see the social enterprise playlist and 100 social enterprise truths), a chance to debate openly and honestly, and a free space to be creative in its thinking. Those in charge of events, conferences and organisational away-days should take note; if we’re all heads-down in survival and delivery modes, the future will be something we experience, not shape. On Tuesday 10th May 2011 a POPse! roundtable discussed whether a ‘right to manage’ would enable people to utilise local environmental assets such as woodlands and waterways to deliver economic, social and environmental benefits to for their communities. The idea of a ‘community right to manage’ was proposed by The Waterways Project who described it as the ‘missing link’ in the Localism Bill sitting somewhere between the new community rights to ‘bid’ to purchase buildings and ‘challenge’ to run services. POPse! provided the ideal setting to examine the proposal in more detail and ask ourselves whether a community right to manage could help deliver environmental localism. You can see the full Roundtable write up here. Thank you to all those who took part or contributed to the subsequent download discussion. One of our themes at POPse! was social investment. Coincidentally at the start of the week, the Cabinet Office revealed some details of the developing Big Society Bank idea, publishing correspondence between the Minister for the Cabinet Office, Francis Maude and Sir Ronald Cohen and Nick O’Donohoe – who have been asked to develop proposals for the Bank’s operation. So at POPse! we gave some thought to costs and benefits of focusing our time and energy on engaging with the idea of this long awaited Big Society Bank. Costs include time and the opportunity cost of not focusing on other important developments. The much-ignored £200m Big Local Trust, for example, which is already getting started, the multi-billion pound Regional Growth Funds, the wider relationship between the state and the high street banks, the Green Investment Bank and others. There is also a potential risk that in talking about the Big Society Bank, we are only inflating an unsustainable bubble of hot air. This week has suggested to us that if you talk about building something for too long, people will lose interest. One of our sessions was characterised by a significant feeling of boredom and indifference to the Bank’s development. Yet the benefits include the potential that there is something still to play for. This could even be a pioneering example of ‘nudge’ at its very best – if you keep talking about building it, they will come. (‘Nudge’ refers to the idea that policies may be better pursued through influencing behaviour through ‘softer’ levers rather than deploying the traditional ‘hard’ levers of, say, taxation, spending and regulating.) Perhaps the promise of supply will create demand? In any case, there could be a lot of money at stake here and potential to harness and build on the vibrancy of a market which many of us care about. So on balance, we have a nagging sense that despite the hype, it’s still worth engaging. So what follows is our own open letter to Francis Maude based on the correspondence earlier in the week, along with the 20 most significant recommendations arising from our discussions. More detail building on the original outline proposal is also provided in annexe. 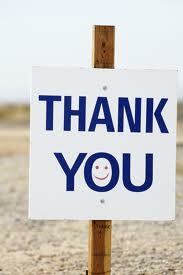 We want to send thanks to those who have helped contribute to our thinking over this week. Particularly Graham from Deutsche Bank, Martin from Social Finance, Mark Campanale, Mark from the Big Lottery Fund, Niamh from Small Change, Helen H, Fergus from the TSRC and everyone else who has dropped by and engaged. Thanks particularly to Joe from NESTA, Jonathan from UnLtd, Matthew from LCRN, Faisel from Fair Finance, Ben Metz, Venturesome and many others. There has been plenty of attention given to how we can encourage and support the emergence of public service mutuals – but as yet there hasn’t been much thought given to what the mutuals market might look like in five years… will it be thriving and self sustaining? Or will it have floundered with public services taken back in-house or contracted out to the private sector? To plug this hole we decided to spend some time with a group of social enterprise experts thinking about what the optimistic scenario (Heaven) and pessimistic scenario (Hell) for the public service mutuals market would be as well as an honest critique of both. We’ve used a pretty broad interpretation of public service mutuals for our discussions: organisations journeying out of the public sector to independence delivering a variety of services. This piece has been developed together with the Transition Institute (TI) – a new, independent centre for research formed to inspire and facilitate new models of public service delivery embedding innovation and social value in the structures. So, it’s been quite a week at POPse! From helping clean and prepare the space, to a different theme happening each day, to the great roundtables and discussions, to the coffee-fuelled research and conversations, to the incessant twitter stream and the contributions of all involved. We’re closing the doors today, but will be back soon with the formal policy reports; so keep an eye out for those. But for now, some thank yous…. A big thank you to partners + supporters: UnLtd, Meanwhile Space, Young Foundation, UnPackaged, Social Enterprise Live, and Imaginals. A humbled thank you to the amazing Jamie Palmer for his artwork in the space (see examples at Jamie’s website). A huge thank you to those who joined in to the POPse! collaborative to take on a theme, organise discussions, and produce credible, challenging and constructive output: Andrew Laird, Mark Walton, David Boyle, Henry Hemming. A similarly large thanks to those who helped with organisation, energy, writing, mini-eggs, tweetchats, and more: Kirsten van der Hout and Dave Dawes. And the Learning Disability Coalition. Plus a big shout out to those who helped make us think we weren’t completely nuts + supported us: Jonathan Jenkins, Ben Metz, Tim West, David Mills, Matt Black, Tim Pope, Dom Potter, Ceri Jones, the OCS team, Steve Moore, Martin Bright, Caroline Mason, Simon Tucker, Fergus Lyon, Jason Mollring, David Wilcox, the OnPurpose crew, and many more. Much gratitude to all those who came to events and made contributions in person: from the local priest to the senior civil servant (and particularly the kid who cycled in, asked what we did, then said “What?! So you come up with ideas? For no money? What’s the point of that?! !” before cycling off….strong feedback); and to all those who similarly contributed online, and helped us reach a bigger audience on Twitter. Please do continue to read, comment, add, contribute, and vote via the categories (Big Society, Efficiencies, Health & Wealth, Mutual spin-outs, Right to Manage, Small Communities, Social Impact, Social Investment) and watch out for the forthcoming reports. If you have any feedback or comments, feel free to add them below. A long time ago, in a land not so very far away, local people were able to use open or common land (including that which was privately owned) to help them meet their basic needs. This included activities such as cultivation, grazing of livestock, fishing and the collection of timber and turf. From the 12th century onwards a series of Inclosure Acts resulted in the enclosure of land, removing it from public access and common use. Despite the protests of movements such as the Diggers in the 17th century this process gathered pace in the 18th and 19th centuries with a series of Acts resulting in the enclosure of over 20% of common land. Even against the backdrop of such a wholesale land grab the ancient rights of ‘commoners’ to graze livestock and undertake traditional activities on unenclosed common land, including that in private ownership, remain in place. Through the 19th and into the 20th century the ‘land question’ (basically feudal tenure, the ownership of Crown estates and the concentration of landed wealth) was a major political issue. After the First World War however a rise in home ownership, the break up of many large estates and land reform laws took the heat out of land ownership issues. During the 20th century, in particular in the period following WW2, many countries saw an increase in state land ownership (up to a sixth of the UK land area at its mid century peak). Since the 1980s neoliberal ideology has promoted the transfer of much state land into private hands and significant land holdings were transferred to the private sector during the 1980’s. Currently the largest government owners are the Defence Estate and the Forestry Commission. Recent years have seen community organisations, led by the development trust movement, engaging in significant asset based community development, and promoting and developing the practice of ‘asset transfer’ of public property (usually local authority assets) to local community organisations. A New Politics of Land Ownership? Asset transfer and asset based development has stimulated a new era of debate and discussion about the empowering effects of ownership including the potential it has to support economic and social development and turn failing assets into successful ventures. The current Government sees community ownership of land an assets as a key part of its ‘localism’ and ‘big society’ agendas with new rights being brought forward to enable the building of homes by community land trusts and the purchase of land and buildings for community use. Concurrently however another strand of the Coalition’s agenda has been less welcomed by communities. Defra provoked a furious public reaction with its plans to ‘sell off’ significant parts of the publically owned forestry estate. The department was forced into a humiliating climbdown despite assurances that the management or ownership of much-loved community woodlands would be undertaken by charities and community organisations rather than private sector commercial operators. The fallout from the forestry debacle reportedly put paid to plans for externalising the ownership of state owned nature reserves and other environmental assets. Proposals to transfer 2,200 of inland waterways from the management of British Waterways (a public body) to a new charitable structure, have survived and are currently out for consultation. However whilst meeting one Government agenda (shrinking the role of the state) the proposals as they currently stand fail to address another agenda (localism) by creating a new ‘big beast’ in the charity sector with a limited role for local communities. Are Environmental Assets a Special Case? 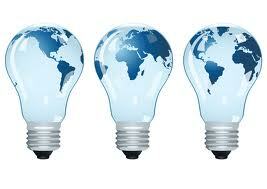 There seem to be a number of issues which arise in relation to environmental assets. These are both practical and emotional. Habitats and waterways networks are often large with strong arguments in favour of managing the assets and policies consistently over wide areas. The waterways network for example often requires the diversion of resources to address issues like breaches, tunnel collapses or other engineering works. It may be that fragmentation of ownership to a community scale would raise practical issues. The forestry sell off, and to a lesser extent the externalisation of the waterways, have tapped a deep public emotional response which seems to feel that these are ‘public’ assets for which government’s should be held accountable and even charitable ownership is seen as a form of ‘privatisation’. In reality however some of our best loved and best supported charitable organisations, the National Trust, Wildlife Trusts and Woodland Trust own hundreds of thousands of hectares of land in the U.K. In practice however management of environmental assets focuses on conservation, heritage and access, preserving them in aspic rather than managing them to maximise public benefit. The current embrace of localism principles recognises that the initiative, imagination, knowledge and capability of communities can often deliver better services, more viable businesses and better managed assets. The incentive for such community led activity is the ability to utilise the asset to deliver a range of local benefits – social, economic and environmental. However whilst environmental assets remain dominated by an expert led approach to conservation and the preservation of heritage they are often inaccessible those who live alongside them. If we are not prepared to accept a patchwork of local ownership of our environmental assets, whether for practical or emotional reasons, perhaps we can enable access in other ways. A ‘right to manage’ or ‘presumption in favour of community use’ could create a straightforward mechanism for communities to negotiate with the owner of the local wood or waterway and agree a lease or management agreement that would deliver cost savings to the owner, and create jobs, training, and social value for the community. In addition to creating mutual benefit, such a right would lower the high bar of ownership, enabling time and financial resources to be committed to generating a viable social business. It seems unlikely that communities in 2011 are champing at the bit to exercise rights to graze livestock or cut turf for fuel. There is however an appetite for low impact housing on waterways, woodland enterprise and food growing and a range of other activities that could reconnect people in a meaningful way with their environment and form the basis of sustainable social enterprise. Perhaps what we need to reinvent a vision of the commons that is fit for the 21st century. The new DH National Commissioning Board should work with the Association of Charitable Foundations and Business in the Community to create effective support (financial and practical) for new and innovative services and delivery paths. The Waterways Project should work with DEFRA and environmental asset holders to create a coalition to promote access to underutilised environmental assets for social enterprise and community use. The Land Registry should provide open access to data on land ownership – providing transparency on who owns what. The Department for Communities and Local Government and the Cabinet Office should deliver a robust Right to Challenge/Provide, which is as universal as possible across public services. If the market is to become truly self-sustaining it needs to be driven from the bottom-up with front line staff groups driving the process. The Office for Civil Society should publish a realistic route map for the creation of the Big Society Bank which includes possibilities (such as consulting on the business plan or directions to the BLF) for social enterprises, intermediaries and citizens to co-design and co-deliver the BSB in line with the Big Society principles of transparency, localism, independence and putting power in people’s hands. Politicians and others communicating public policy should push for ‘stronger communities’ only if they recognise that a really strong community could be a place that empowers only the local busy-bodies or unelected ‘community leaders’ with a sense of justice that is unchecked. The Cabinet Office should launch a grassroots efficiency and innovation campaign for frontline public service staff, along the lines of the National Performance Review in the USA. Social enterprise trade associations, representative organisations and social impact measurement specialists should work together to create sub-sectoral impact measures and understanding of barriers to implementation. One or more grant-making trusts or infrastructure bodies should start the UK equivalent of the Collaboration Prize (see www.collaborationprize.org) to provide an incentive and recognition for partnership working in the sector. Social investors, the Association of Charitable Foundations and the Cabinet Office should ensure that the development of leadership skills is given greater consideration as part of investment decisions in order to deliver greater social change, impact and success. Very deep, very powerful conversations are very rare. The Cabinet Office, Society Media, the Social Enterprise Coalition and the Third Sector Research Centre should collaborate to create ways to raise the level of critical analysis and debate around social enterprise policy and practice. Within so many public sector programmes, speeches on the Big Society, charitable endeavours or social enterprise models you’ll find one ubiquitous term: community. It might be that communities are to be empowered or engaged; they are to be given the opportunity to take over local assets; perhaps communities are to be encouraged to make decisions for themselves. But for a community to do any of these things it needs to, well, exist. Its members must come together to achieve and articulate a consensus, and be able to do this on a frequent basis. Too often we imagine that a series of people living in proximity to each other constitute a community when really they are simply an aggregate. In that case how do communities come about, why are they in decline, and are we right to place such emphasis on the empowerment of communities? On Thursday 12th May at POPse! there was a roundtable discussion on this. What followed was a fascinating account of where we are on community today. It featured contributions from a range of participants including a local vicar, a philosopher, a government employee and a hacker. Of course, it being POPse! there was also a good sprinkling of social entrepreneurs. Collaboration is a wonderful thing. All week, POPse! has been collaborating: with our wonderful hosts, Meanwhile; with our daily stream of guests; with the epicures in Exmouth Market. We are a collaborative, we have no one leader. We exist therefore we are, and today we will evaluate our impact. We shall ask meaningful questions like: did we do what we set out to? And, what is the spillover effect? And, does beer spillage count as a measure of success? (if so we’re in luck – see photos from the SE Alley massive at our place last night). In preparing for this collaboration, we overlooked something which has proven to be of interest this week. Rather than just listening to this week’s pearls of wisdom, some people have wanted to attribute our musings. WHO are we (as individuals), it seems, is just as interesting as WHAT are we (saying). Over a beer – there is a theme developing here – the collaborative thought about it and decided that we had missed a labelling opportunity. It seems that self interest is not anathema to collaboration. In fact, that very point was tabled in our round table on small communities and the Big Society. Seriously. Co-produce services to reach out and rebuild community. More entertaining than the topic might first suggest – he asks what’s the difference between real and fake efficiency really is and how we get the first and unmask the second.